I am back again today. Am feeling blue that Monday and work and school are all starting up. I guess I need to enjoy my last day tomorrow. Anyway, I found out on Friday that a colleague's mother passed away after a long hard battle with cancer. So this card is for her--she has shown great strength and poise throughout this time...more than I could imagine doing if it was me. The card I made is simple, but elegant (I think at least). 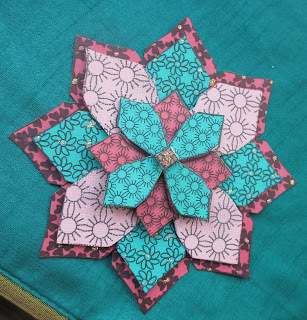 I used an SU mandala stamp and cut it up, layering it with foam tape. All the SU punches worked great for this. As you can see...quite a few Swarovski crystals to bring the card from drab to fab. Nothing like a little bling. Would you indulge me in a little bit before I log off? Below are a few creations by my older daughter Julia. She hasn't been so much into card making lately so I was thrilled when she made not just one, but TWO creations, seen below. The second is a mandala stamp from the now closed Outlines store. I so miss their beautiful mandala creations and stamps. hello! your card is gorgeous! Thank you for playing with Little Blue Button Stamps! Good luck! 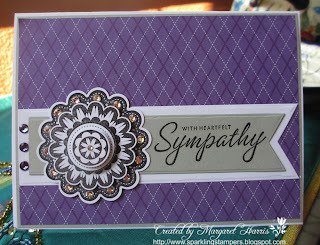 Your card is so lovely - simple yet fancy! Love those Swarovskis! Julia's cards are quite good! I have enjoyed seeeing her latest creations!! !